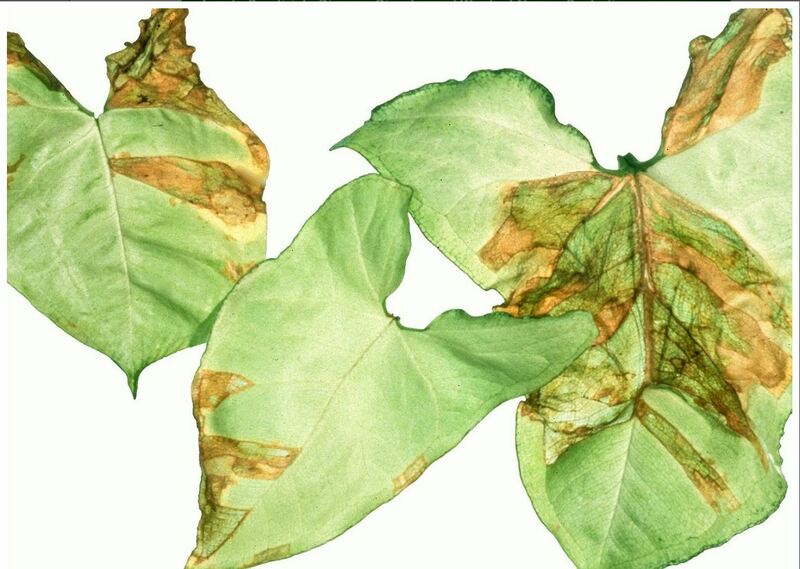 Name: Xanthomonas leaf spot – Bacterial leaf spots/blights and scalds – Xanthomonas spp. There are many species of Xanthomonas that can infect a large number of nursery crops including plants from Brassiceae, Solanaceae, Cucurbitaceae, philodendron and many other ornamental lines. The exact symptoms depend on the species infected but often involves small, angular, water-soaked spots on leaves that turn brown and may coalesce. It may also cause a leaf blight that can cause leaves to fall from the plant. On other plants the leaves may develop a V-shaped, yellow area along the leaf margin that turns brown and causes veins to turn black. The bacterium is transmitted with infected seed or contact from contaminated tools and machinery. The bacteria can survive on undecomposed crop residues and live epiphytically on the plant without causing any symptoms. The bacteria enters the plant through wounds caused by hail or wind-damage. Once the disease is established it is spread by rain and irrigation water splashing from infected plants or wind borne water droplets, and the movement of workers through the wet crop. Initial spread may be from the transport of propagating material. Warm temperatures, high humidity and free water on plant surfaces. Extended periods of leaf wetness allow the bacteria to multiply causing rapid symptom development. Any damage to tissue can also favour infection.